On Saturday the 25th of April the 2015 Mock Trial team trekked out to the Criminal Courts Of Justice in Dublin, to compete in the annual mock trial competition. The team consisted of researchers, barristers, solicitors, witnesses, T.V reporters, legal reporters, tip-staff, a photographer, a sketch artist, a timekeeper and a couple of jury members. The team spent many weeks preparing for all aspects of the cases, with the help and guidance of Mr Daly and Ms O'Neill. The very successful 2014 Mock Trial Team also assisted the girls in their preparation. This year the team prepared for two cases, based on an arson attack and an assault case. The researchers prepared the stories of the witnesses. The barristers used this information to help with their chief and cross examinations. The team were one of the 34 schools competing on the day, for an invitation to World Final in New York. Although the team performed extremely well at the competition, unfortunately they did not progress into the next round. It was a wonderful experience and great fun was had by all. The final of the Junk Kouture fashion competition took place last Friday 24th April. Eighty students donned their creations taking the 3 Arena stage by storm in the show hosted by Xposé's Glenda Gilson. Five dresses from our school's entries got through to the prestige final. It was judged by four judges, including Louis Walsh. After months of hard work and dedication, the girls' creations stormed the catwalk and were seen by thousands in the audience. Around fourty TY students went to support the girls on the big night. We couldn't believe the final products, they were so impressive! After much consideration and anticipation, our school's entries were awarded two distinguished and coveted awards! 'Queen of the Forest' by Aurika Syribu, Ruth Moore and Caoimhe Mackey was awarded best hair and makeup. 'Building Blocks' by Aideen Rafferty and Siobhan McCormack was crowned the winner in the Eastern Region! Both designs were without a doubt very deserving winners and blew us all away. All entries from our school were amazing and a huge congratulations to all the teams who took part! Aideen Rafferty of 'Building Blocks' even got the opportunity to appear on RTE's Saturday Night Show with Brendan O'Connor modelling their dress, while Siobhan watched from backstage! It was a great experience for everyone involved and they made all the supporters and teachers proud as they represented the school so well! Kelly, Laura and I were part of the dancing chorus. We danced in, "Beautiful Girls", "Broadway Melody" and "Singing in the Rain". Dedication, practice and teamwork was required in the making of these dances. We all had a great time creating and performing these numbers.The costume and make up was a fun aspect of our experience and performing on stage was something we had never experienced before. From stressful rehearsal to showtime performance, participating in the dance chorus has been spectacular. It was a great bonding experience for the year as a whole and we will never forget that it was the highlight of our Transition Year. During the TY Musical I was member of the Costume, Make-Up and Hair Department.We took care of all the costumes for each character, chorus and scene. We rented out a beautiful Victorian dress for the "Dualing Cavalier" scene.We stitched fringe onto dresses, we made handbags and made so many other essential costume pieces. Each person was either assigned a lead character a certain scene from the play. I was assigned the "Dream of You" chorus scene.On the night we had to ensure that each person was in full costume and that they had their hair and make up complete. The entire experience of the musical was wonderful. The atmosphere in the week running up to the show was electric. Everyone was excited. I developed new skills in needlework, organisation and communication. I really enjoyed making new friends and working with new people from my year. It was truly an experience I will never forget. 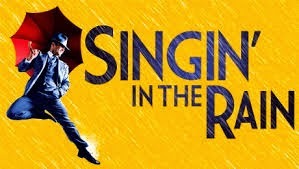 In September 2014, I began auditioning for a leading role in the transition year musical 2015 "Singing in the rain”. All the girls who were auditioning were put through their paces in a series of singing, dancing and drama auditions in order to claim their leading role. In the beginning of December the show was cast. I was given the part of Cosmo Brown, it fair to say to say I was absolute thrilled. All along Cosmo Browne had definitely been one of my favourite characters in Singing in the rain and could not believe that I had been given the opportunity to play this comical, dandy, all singing, all dancing lead. From the moment the show was cast there was never a dull moment of a Thursday morning. Everyone began learning songs and really trying to get to know their character. The excitement in the hall on a Thursday morning was immense. At times I felt I was back in the 1920's Hollywood! As opening night was getting closer and closer. We then began are all day rehearsals and that's when the really work began. It was time to start learning the endless pages of lines and choreography. Even though it was hard, I loved every minute of rehearsals. I personally got so close with my fellow leads and I think that's what I miss the most about the musical. We had such fun in rehearsals and most of all before the nights of the musical.After two weeks of rehearsals and all day Saturday rehearsals it was time to face the public! I was so nervous on opening night but I think I was excited more than anything. The question that played on everyone’s mind was would our hard work pay off?...... And indeed it did! The reaction from the public over the course of the four nights were amazing. I don’t think anything can top the feeling I got when I walked out by myself to take my final bow. I was devastated to say that the amazing rollercoaster that the musical was was over. It was a feeling of poor joy and also of pride. I was so proud to say that our year had achieved such an amazing thing , to such a high standard. By far the musical has been one of my main achievements and highlights throughout Transition Year and most certainly it will be forgotten!